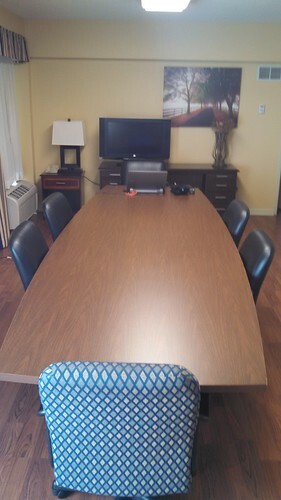 It's a full-size boardroom table. This room would be big enough for an SFSFC Board of Directors meeting if you added some chairs. There is a standard-sized bedroom beyond this room, and an ordinary bathroom attached. There's also a microwave/refrigerator/sink in this over-sized parlor. A significant fault: to get from the bedroom to the bathroom, you have to go through this boardroom parlor with its hardwood floor. This is not fun in bare feet. The room would have worked much better if the bathroom attached directly to the bedroom, with a half-bath (toilet/sink) near the front door entrance to the parlor. There being limited space in the bedroom, we stacked our luggage on the boardroom table. (I thought of leaving it there for the photo but decided to make things look nicer.) We actually don't like the room that much and asked for a standard room, but apparently this was the very last room they had and the only reason they didn't "bounce" my reservation to another hotel was due to my platinum status. With a better configuration, this would have been a wonderful room if I were chairing a convention here. Our train to Detroit leaves at 2:50 and we have a 2 PM check-out. We're about to pop out for breakfast, then come back to the hotel and get our luggage and roll back to Union Station, after having had 7-8 hours of sleep after all.